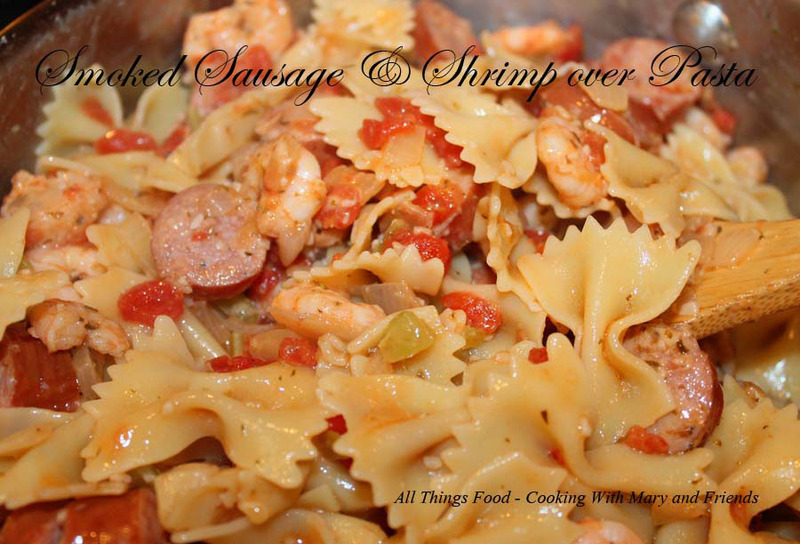 I really love Shrimp Creole, Cajun Shrimp and Sausage and other dishes, but the hubs does not, so this Smoked Sausage and Shrimp over Pasta was formulated with an "Italian" flair to satisfy both of us. It's a super-easy, quick weeknight meal, but fancy enough for company. You can use any pasta you like; bow tie, penne, angel hair, fettuccini, linguine, whatever suits your taste. Serve with some garlic bread and a side garden salad. Cut sausage into slices; set aside. Cook pasta according to package directions; drain and keep warm tossed with a little olive oil to keep pasta from sticking. Heat oil in large non-stick skillet over medium-high heat; stir in smoked sausage and cook 3-4 minutes or until sausage is brown; toss in shrimp and cook until just pink; remove from skillet and set aside. In the same skillet, melt butter over medium-high heat. Add celery, onion and black pepper. Cook, stirring frequently until vegetables are sauteed', about 4 minutes. Add cooked pasta, drained tomatoes, Parmesan cheese, Italian seasoning, oregano and sausage/shrimp mixture. Stir gently to combine over medium heat until hot; add salt to taste. Serve immediately.